Norwalk’s Sanaa Boyd drives to the basket against Hamden defender Diamond White on Monday. The No. 1 seeded Norwalk girls basketball team is heading back to the CIAC Class LL state championship game for the first time since 2000, beating No. 4 Hamden 62-54 Monday night at Warde High School in the semifinals. This will be Norwalk’s sixth appearance in the championship game, winning the Class LL tournament twice in 1981 and 2000. The Bears will take on No. 2 New London in the championship game in a rematch of a game Norwalk won at New London 49-47 on Jan. 26. For this group of Bears, most of whom were not alive in 2000, there is no better place to try and wrap up an unbeaten season than at Mohegan Sun. Wilson finished with 14 points for Norwalk with Naeva Rene putting in 16 and Belinda Hunte leading the way with 18. 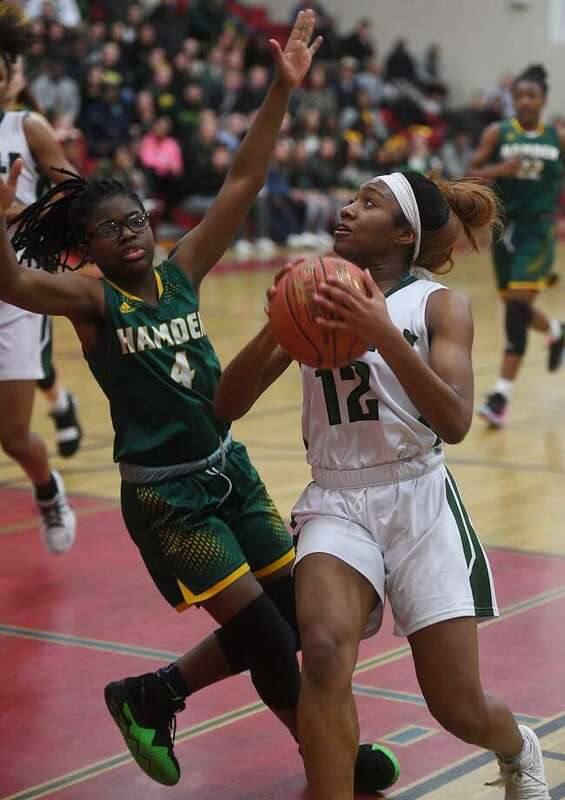 Norwalk’s defense was swarming all night, holding Hamden’s top two scorers in check with Taniyah Thompson scoring 10 points and Makaela Johnson 11. Junior point guard Asya Brandon paced Hamden with 19 points. Norwalk led by two at halftime but outscored Hamden 18-5 in the third quarter. Norwalk led 44-27 after three quarters but the Bears missed 13 free throws over the final eight minutes, allowing Hamden a glimmer of hope. The Dragons closed to within 57-52 with a minute to play but could not make up the entire deficit. Sanaa Boyd, Norwalk. Boyd scored six points but it was her work defensively on University of Rhode Island-bound Thompson which set the tone for the Bears. Boyd held Thompson to just three field goals in the game. “This is the end of road and what we have been looking forward to all year. It’s been a really good season and hopefully we can end it on a positive note. (Boyd) is the best defender in the state. I have been telling people all year. People like to look at offense, offense, offense but if you have a lock-down defender like we have, you can go against anyone in the state. She wasn’t scared and she didn’t back down.” — Norwalk coach Ricky Fuller. Hamden coach Amanda Forcucci was not available after the game. Asya Brandon 6 6-8 19 Rebecca Oberman-Levine 3 0-0 6 Yariliz Santiago 0 0-0 0 Makaela Johnson 4 1-2 11 Taniyah Thompson 3 4-6 10 Kyndal Russell 0 0-0 0 Diamond White 0 0-0 0 Sarah Streete 3 0-2 6. Totals: 19 11-19 54. Sanaa Boyd 3 0-03 6 Ashley Wilson 4 4-5 14 Jakara Murray-Leach 3 1-5 7 Naeva Rene 5 5-9 16 Belinda Hunte 8 2-6 18 Carsyn Langhorn 0 0-0 0 Anaijah Morgan 0 1-2 1 Serenity Mayhew 0 0-0 0. Totals: 23 14-31 62. 3-point field goals: H—Johnson 2, Brandon; N—Wilson 2.; Fouled out: none.